In addition, the team’s two female crew, Carolijn Brouwer of the Netherlands and Marie Riou of France, scooped the Rolex World Sailor of the Year Award in the female category in recognition of their contribution to Dongfeng Race Team’s success. Sponsored by Dongfeng Motor Corporation of China and skippered by Charles Caudrelier of France, Dongfeng Race Team triumphed in a gruelling, dramatic and closely-fought Volvo Ocean Race that came down to a nail-biting run-off between Dongfeng, MAPFRE and Team Brunel in the final leg from Gothenburg to The Hague in June. Choosing a risky inshore course on the approach to the finish line that paid off handsomely, Dongfeng Race Team achieved not only its first leg win but overall victory at the conclusion of its second successive entry in the what is regarded as the world championship of fully–crewed offshore ocean racing. Yann Rocherieux of France, World Sailing Athletes’ Commission Chair and Board Member who was part of the Team of the Year Award judging panel, said: “The calibre of entrants for the 2018 Team of Year Award was extremely high. The depth and breath of the sport was represented, but Dongfeng Race Team truly shone above the rest. Brouwer and Riou triumphed in a poll made up of votes from the general public with those of World Sailing’s Member National Authorities. The other sailors on the shortlist were Caterina Banti, the Italian 2018 Nacra world champion, Daniela Moroz, the American 2018 Formula Kiteboarding world champion, and Wendy Tuck, the Australian winning skipper of the Clipper round-the-world race. Bruno Dubois, Team Director of Dongfeng Race Team, said both the team and individual awards were richly deserved. 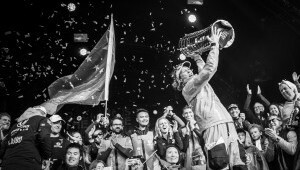 “Everyone in Dongfeng Race Team can take great pleasure and be proud of being recognised in this way by World Sailing and the sailing public,” he said. “I am delighted that both the team as a whole and our two amazing female sailors have been honoured. We set out to win the Volvo Ocean Race over two campaigns and we achieved all our goals, something we could not have done without the steadfast support of our sole sponsor, Dongfeng Motor Corporation, so I would particularly like to thank them,” he added. Caudrelier said the awards reflected both the individual contributions and the spirit of a team that combined men and women from more than 10 nations and included young Chinese sailors in Wolf (Yang Jiru), Horace (Chen Jinhao) and Black (Xue Liu), who were selected and trained by the team. Brouwer, aged 45, was racing in her third Volvo Ocean Race campaign and is also a three-time Olympian. This is her second World Sailor of Year Award, having won it 20 years ago in recognition of her Olympic campaigns in the Europe dinghy. The Dutch sailor was selected for every leg of the race on board Dongfeng as a trimmer and a driver and, along with Riou, became the first woman to win the race. Riou has just been announced as the first female crew member of the French SailGP team for the World Sailing-sanctioned SailGP racing league that will take place around the world next year and finish in Marseille in September. Dongfeng Race Team was managed and created by OC Sport, the leading global sports event manager that has an extensive portfolio of sailing event and team management successes to its name. Hervé Favre, Co-CEO in charge of sailing at OC Sport, said: “Dongfeng Race Team captured the hearts and minds of millions of followers in China and around the world with its tenacity and spirit during an epic Volvo Ocean Race.